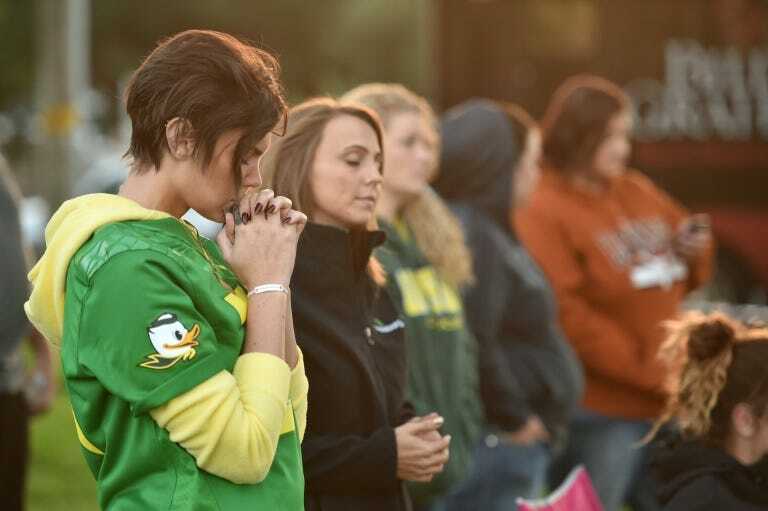 In Roseburg, the small western US town thrown into the national spotlight last week by the shooting of nine students, it was time to reflect and pray Sunday. The tragedy was very much still present at New Beginnings Church of God. Pastor Randy Scroggins's daughter, Lacey, survived the shooting by playing dead and hiding behind the dead body of one of her classmates. "The God who was good for us yesterday is still the God who is good today, even if we do not understand what happened," Scroggins told the church. The pastor paid tribute to the victims, aged 18 to 67, and in particular to Rebecka Carnes, whose grandparents were on hand for the service, and Treven Anspach, whose body knocked down and hid his daughter during the melee. Before the service, Scroggins shared Lacey's story. He said that when the shooter, Chris Harper Mercer, first entered their classroom, Lacey thought it was a joke or a security exercise. Then the shots started. Their instructor, Lawrence Levine, fell first, followed by students, one by one. "Lacey was preparing to die. She heard a gunshot and felt Treven's body knock her over. Then something warm: his blood." Harper Mercer told Lacey, "You, get up," but she was paralyzed by fear, blocked by Treven's body and covered in blood, Scroggins said. "He believed she was dead. He went on to the next," Scroggins recounted, in tears. Now, Scroggins said, "sometimes she will be fine, and then she collapses. Whenever there is silence, she hears the sound of bullets." During his sermon, Scroggins was resilient. "We will not let ourselves be defined by violence!" he shouted, before recalling the September 11 attacks and other school massacres: Columbine, Virginia Tech and Newton, Connecticut.